Walking will always be an integral part of our lives. Whether we're travelling or going about our daily routine, we will always be doing a lot of walking. And considering that we'll take around 220 million steps (can you imagine?!) in our lifetime, why do it in uncomfortable shoes? Choosing the right pair of shoes has been very important for me ever since I started working. Back then, as long as it fits and the design is nice, I'll go with it. 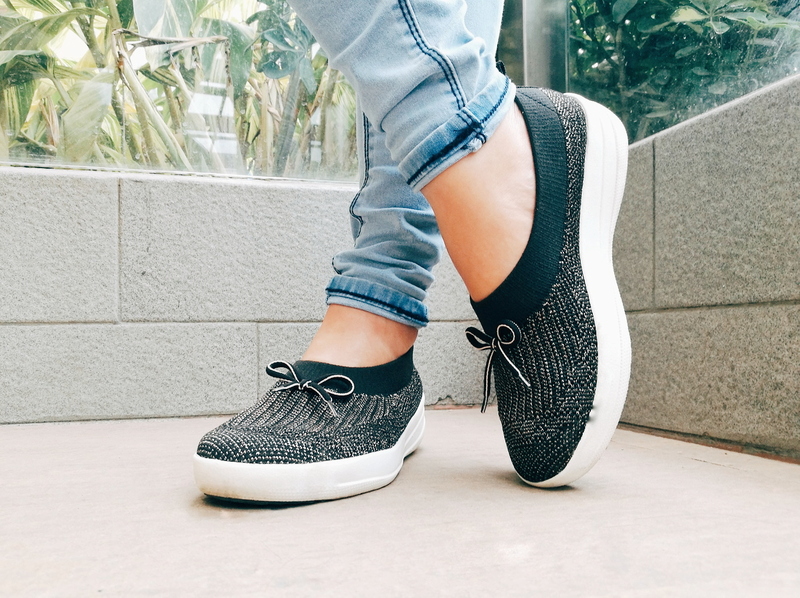 But now that I commute to work every single day and attend blog events in some days, I really take time in choosing shoes that are comfortable to wear and does not hurt my feet after a long walk or when wearing it for the first time. And with FitFlop's recently launched Autumn 2017 Collection, different styles of shoes are now readily available for women of all shapes and sizes without even compromising style to enjoy comfort. We all know that FitFlop has been internationally recognized as a comfort footwear brand. They first brought biomechanically engineered sandals to thousands of comfort-seeking women from all around the world. After ten years, they have now broadened their range by finally introducing sneakers, loafers, and skates. And this year's Autumn Collection, FitFlop focused in creating wardrobe essentials for women in several colourways, finishes, and hardware through their three main inspirations: Space-Age Metallics, Modern Heritage, and Rebel. As the season transitions from summer to autumn, FitFlop features metallic detailing across several FitFlop styles. Their Halo, a toe-thong sandal, has high-octane glittering discs. Their Uberknit high-top sneakers and ballerina has been updated in pewter, rose gold, and black metallic. Lastly, their Superballerina, a graceful, low-cut, feather-light ballerina, is being smothered in shimmering sequins on its slimline SupercomFF midsoles. The Modern Heritage trend can be seen across FitFlop's mules, ballerinas, and sneakers. The Superskate slip-on mule, a key shoe style of the season, is offered in buttery leather. They also have the same Uberknit high-top sneakers and ballerina bow in non-metallic colors. The Rebel series has a color palette of deep plum, midnight navy, tan and black, with spanning patent, snake, and suede finishes. The Lumy slides and Banda sandals replete with punk stud detailing perfect to be paired with your skinny black jeans and channel your inner rebel. I currently have the Uberknit ballerina bow and I have been using it ever since I got it. I have to be honest that it has to be the most comfortable shoes I have ever worn. The Uberknit ballerina is the shoes that has more pump and less thump. It's super soft, stretchy, feather-light, and very comfortable. I walk in long distances everyday and I swear my feet has never swollen! Indeed, FitFlop's priority is comfort-based biomechanics because they believe there's no need to compromise on style to enjoy comfort. With their unbeatable ergonomics, super lightweight midsoles, and breathable stretch uppers, FitFlop is definitely the perfect choice for women always on the go! Ka arte sa tiil oi! Super nice, looks very comfortable. I have thong-sandal with synthetic crystals, napul-an nalang ko wa jud maguba. Grabe lig-on kaayo! I love FitFlop! We have a few that I use everytime we go out, and I'm eyeing to buy one to use for work. Go Richel! Go for their sneakers! Sobrang perfect for everyday use! I'm seriously loving the look of the sneakers - they look so comfy and chic! Go buy one, Eena! Super worth it! Oh my gosh, I wish I'd had these in San Francisco a few weeks ago! I love love love the pair you have on in the first picture. But they all look amazing and super comfy. I'm going to need to invest in a pair for our next trip! These shoes look so comfortable! I love the sandals.